Way back in January 2009 the staff of Shanghai Scrap told you about the demolition of Shanghai’s (then) 135-year-old Carmelite Convent on the edge of the expensive, rapidly re-developing Xujiahui neighborhood (part 1, complete with historical background, here, and part 2, here; background on Carmelites, here). The building wasn’t anything special – except for the fact that it was one of the city’s oldest structures, foreign or Chinese. But what made this demolition so egregious, so patently ridiculous, were the stated intentions of the (re) developers to build a 20% smaller replica of the convent just a few meters south of the original one. 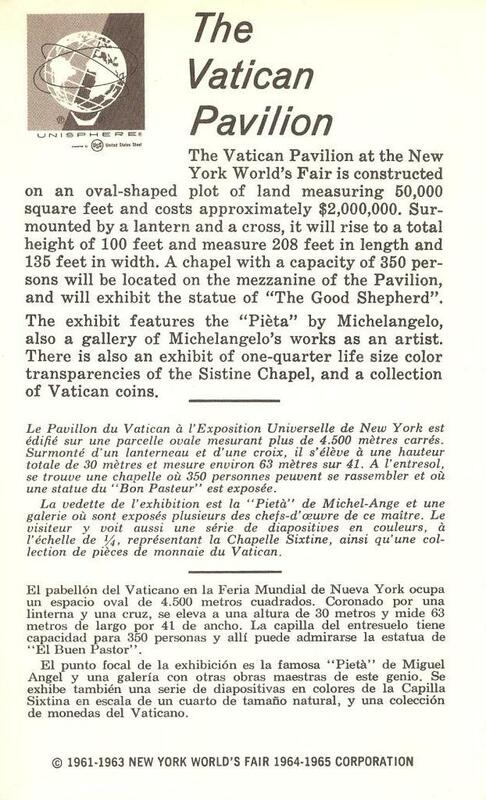 [UPDATE: also see comment #1, below, left by Lisa Movius, on why the destruction of the convent “was criminal – literally”] This struck me as stupid and wasteful, but I’ve been here long enough to know that it should also strike me as one more thing: typical. That is, the Carmelite Convent is not the only historic structure in Shanghai to be demolished in favor of a replica that – for whatever reason – is more in the interests of the developer. In fact, in the case of some dilapidated slum dwellings, this might often be a good thing. In others, less so, to put it lightly. Anyway. I’d mostly forgotten about this sorry Carmelite episode until this weekend, when I happened to pass the site of the old convent in a taxi and saw that it was being rebuilt. I returned a couple of days later, with a Benedictine, to photograph it. 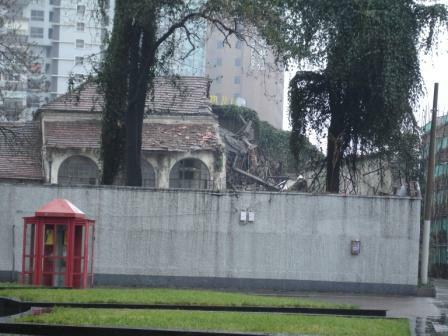 Here, from January 2009, is the historic convent in the last stages of its demolition. Take note of the roof, and the close proximity of the remaining structure to the fence. And then, have a look at the photo below. 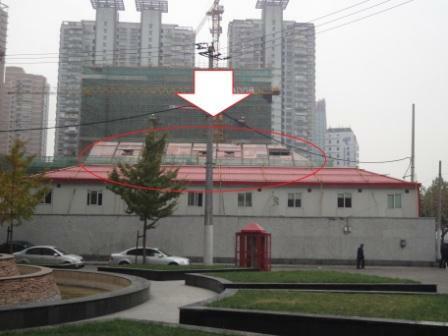 The arrow points to the roof of the new convent. The white buildings in place of the old convent are dorms for workers building the replica convent and the highrises that will surround it. Expo 2010 has a little bit of everything, but it sure doesn’t have one of these. 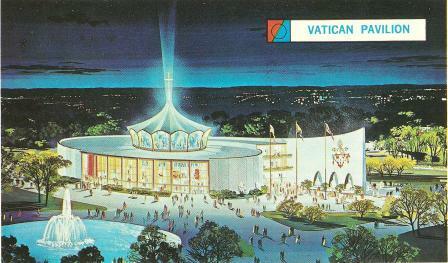 I was working up an article on Expo 2010 (World’s Fair) a few weeks ago when – by accident – I came across (and then purchased) this vintage postcard showing the Vatican City pavilion from the 1964/65 New York City World’s Fair. 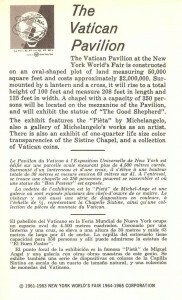 And the back side (click to enlarge for text). 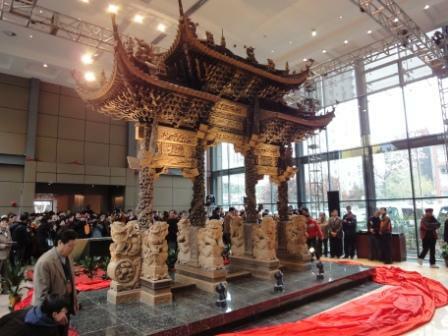 Orphans and Woodcarvers: Shanghai’s Prodigal Memorial Gate Returns Home. 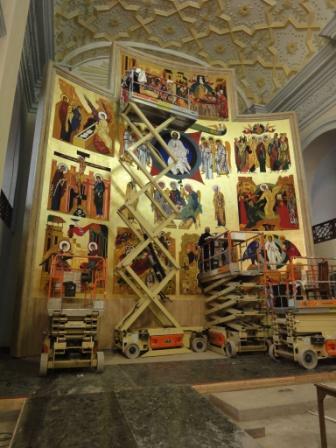 What is the status of the project to restore the stained glass windows of St. Ignatius Cathedral in Shanghai, and can you put me in touch with the artist? Well. Long-time readers of this blog may recall a series of posts that I wrote back in late 2008 covering the installation of several dozen new stained glass windows into Shanghai’s century-old Catholic cathedral (here, here, and here, among others; my lengthiest treatment of this project in traditional media is this 2006 piece for the now defunct LA Times Sunday Magazine). As commissioned by Shanghai’s bishop Jin Luxian, these windows aren’t restorations of the windows destroyed during the Cultural Revolution, so much as they are an entirely new cycle of stained glass that merges Chinese characters, idioms, and artistic traditions with Western liturgical art and stained glass. 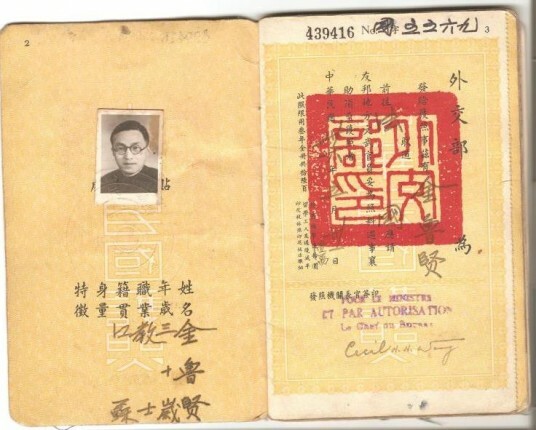 The artist entrusted with this unprecedented commission is Wo Ye, Beijing born and bred, trained as a traditional Chinese painter and, later in life, trained in Catholic liturgical art in Italy and the United States. There’s really nobody else with her background, and training, anywhere, and that not only explains the commission, but why she is – best as anybody knows – the only woman or Chinese to ever get such a commission. 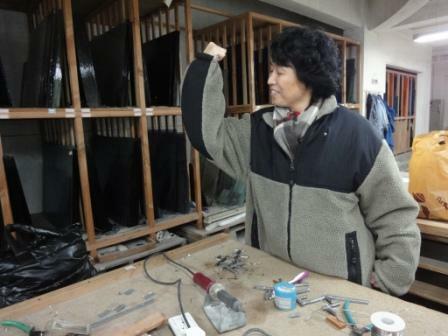 Shanghai Scrap: Do you want to say anything about your upcoming plans for the cathedral windows? Designs, anything like that? Rumor has it that the second level nave windows are next. More when I have it. Quite a bit of thanks is due to the very kind, very hospitable brothers at Trinity. I had the privilege of spending a long weekend with them (and doing the reporting for this story) in the midst of a long, totally unrelated reporting trip in late May and early June.